This is the first book in a new series set in the same Universe as my earlier trilogy about Earthlings finding their place in the galaxy, the T'aafhal Inheritance. I'm calling this and forthcoming tales the T'aafhal Legacy series and it is an open ended proposition. I have been storing up a number of adventures involving the crew and characters from the first three Peggy Sue novels—some ideas I have had from the beginning, while others are prompted by questions and suggestions from readers. There is no overall story arc as there was in the trilogy, and the books may not be published in strict chronological order. 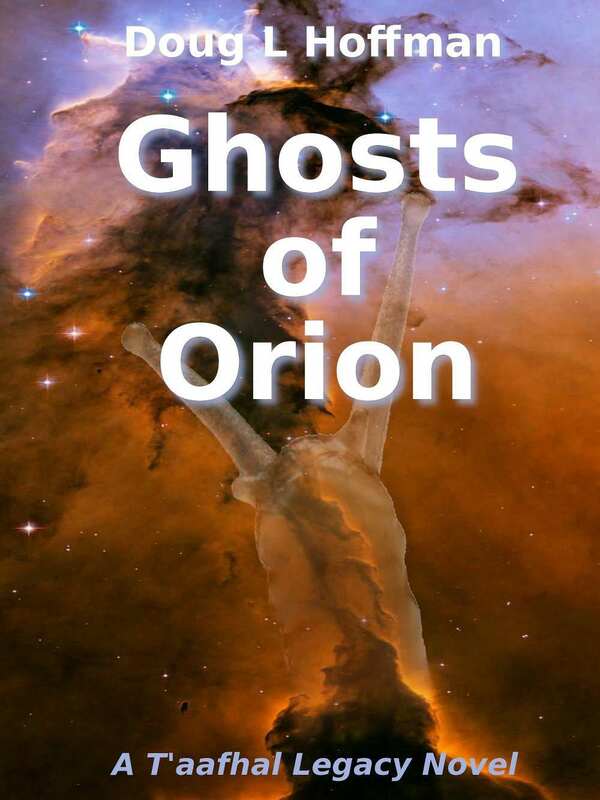 This novel, the Ghosts of Orion, follows the further adventures of the crew of the Peggy Sue, this time without the leadership of Jack and Ludmilla. Instead, Billy Ray and Bobby are in the lead, along with their significant others, Beth and Mizuki, respectively. There are other characters from the previous stories as well as some new ones. As always, there will be strange new worlds to explore and even stranger aliens to meet. As always, I thank my early readers for their many corrections and suggestions: Rik Faith, Stuart White, Bobby Johnson, David Metheny, Clayton Ward, and Jesse Perkins. Mistakes that slip through are all my fault, certainly not theirs. If you like this book please tell your friends. If you really like it consider writing a review online at Amazon.com. The Senior Academician fumbled with the recorder connections. Anxiety made the familiar task frustratingly difficult. With a sigh she looked out the arched side window at the tranquil scene beyond. Puffy white clouds, blushing red at their edges, floated in a cerulean sky. Below, trees adorned in light green leaves brushed fields of red flowers with graceful ground-sweeping branches. Scattered among this verdant display were the flowing white stucco shapes of the city's houses and buildings. Her city was located well inland, a center of commerce for the large farming region in the heartland of the planet's largest continent. Home to perhaps 150,000 souls, it was not a large city, yet big enough to warrant its own branch of the state University. Years ago she had accepted a position here, to live and raise her daughter in a more natural environment. It was not like the major cities along the coasts, where graceful spires reached for the sky and people teamed among them in their millions. The glitz and glamor of big city life beckoned to many, but not to her. This lovely little city ran at a slower pace. It was a paradise where one could escape the hustle and bustle of big city life. A paradise soon to be lost. Returning her attention to the device in front of her, the Senior Academician finished attaching the leads to the recorder. She often came to the Hall of Memories to make archive copies of her thoughts—much more frequently than average citizens were wont to. In fact, the large hall was empty; she was the only person making a deposit into the city's collective memory this day. But then she was, above all things, an historian. It was her obligation to record events for the edification of future generations. A soft green light glowed on the console, telling her that the recording process had begun. Closing her eyes, she thought back over the events of recent days. Four days ago, it was a day like any other. The red sun rose, accompanied by its two companions, a sliver of the inner planet just visible in the morning light. Several bright streaks marked the passage of meteors out over the middle sea. Normally, meteors marked the death of the objects that caused them, the objects themselves evaporating into nothingness during their fiery transits. But the objects that morning survived to reach the surface of the sea, completing their transformation from meteoroid to meteor to meteorite. Given the heat generated passing through the planet's atmosphere, it seemed improbable that anything living could survive the journey. Yet something did survive. Whether that something was actually alive was a matter of debate among the more scientifically oriented academics the historian knew. Not that the debate had much time to develop. A day after the impacts it was noticed that fishing boats and pleasure craft were failing to return to port. The reason for this soon became apparent when something emerged from the coastal waters and began moving inland. Her colleagues were still unsure just what the invader was: Was it a single organism or several? Was it intelligent or not? Was it plant or animal? Was it even alive at all? Their ignorance was not alleviated as the foul pestilence spread inland consuming everything before it. Scientists sent to analyze the infestation did not last long enough to report back, let alone learn enough about the threat to suggest countermeasures. From remote cameras, the pestilence itself appeared to be a simple black substance with root-like runners spreading out before it. It advanced like a black tide, pouring over everything in its path. On encountering anything organic, runners shot out of the main mass, racing ahead faster than a person could run. Black tendrils of death that enveloped every living thing—people, plants and animals all were consumed. The runners quickly wrapped the people they overtook in black cocoons, while exuding some form of acid that rapidly dissolved the hapless victims. Were they being digested to feed the spread of the expanding mass? No one knew for sure. At the trailing edge of the swath of death, the black material soaked into the ground without a trace. All that was left was a barren wasteland where nothing living survived. The infestation raced inland, destroying cities and towns, farmland and forest. Flying creatures vanished from the air above and aquatic creatures from the waters of sea, lake and river—even diatoms and plankton. Nothing was spared. Trying to maintain her composure, the Senior Academician thought about these matters, hoping to leave a clear record of her civilization's final days. She had dutifully entered recordings of the destruction of her world into the archives and now it was almost upon her city. Though this was only a minor city, and a minor branch of the University, she had a scholar's pride in her work. If anyone survives, if people come in the future, they will find that she performed her duties properly. The door to the hall flew open. Standing there in the light was a single young girl—the Senior Academician's daughter. Glancing sideways out the window, the Senior Academician saw the graceful trees being torn down by whipping black sinews and the bright flowered fields turn to putrescence. How can something so vile exist? She looked back at her daughter, her only child. The girl's final cry became a short strangled scream as black filaments whipped around her body. A hissing, sizzling sound arose as the dark threads sank into her living flesh. Within seconds, all that was left was a crumpled black mound, slowly sinking back into the mat of alien corruption spreading across the floor. The Senior Academician forced herself to not look away. She was an historian; those who might come in the future deserved an accurate record of the end. The storage array was inorganic, made of metal and glass and doped semiconductors, a vast repository of memories recorded by generations past, all stored as holograms, interference patterns in blocks of impervious crystal. Once recorded, the information held within needed no energy supply to sustain it. Scholars like herself and everyday people had been storing their life memories in the Hall of Memories for more than a hundred generations. Hopefully it would be impervious to the ravaging alien pestilence that reached for her. not bravely shouting defiance at our foe, but each one alone crying for help where there is none. As she had promised her daughter, the searing pain lasted only a moment. Under the baleful glare of a small red star the fabric of 3-space rippled and shimmered. Accompanied by a burst of gamma rays and a spray of fundamental particles, a survey drone emerged from alter-space. Around it lay a system rich in rocky planets—three of them within the star's calculated habitable zone. Two other major planets and the usual collection sub-planetary flotsam rounded out the family album, but it was the three super-earths that interested those who sent the probe. was actively looking for new planets to inhabit, new worlds to call home. This system, cataloged as Gliese 667C, was known to humans prior to the discovery of alter-space transit, back when traveling to the stars remained the stuff of fiction. Now, having cleared the surrounding 10 parsecs of known hostile species, the surviving natives of the planet called Earth were starting a diaspora on which their future survival could well depend. The robot probe quickly found its own location within the system: a quarter of an AU from the star and slightly above the planetary orbital plane. There was a large rocky planet very close to the star, with an orbital period of only seven days. That one would not be friendly to Earth life. O—the single most important substance for terrestrial life.